I had a chance to sit down with Chris Fritzsching, Director of Detroit Lions Youth Football to discuss the importance of player safety and how the NFL and the Detroit Lions are promoting youth football safety. Oakland County Moms readers know that we are great fans of the work that Detroit Lions Youth Football puts into their programs. Quite simply, the camps promote football and exercise for boys and girls ages 4-18. Camps and academies emphasize education, fitness & fun while teaching football fundamentals. 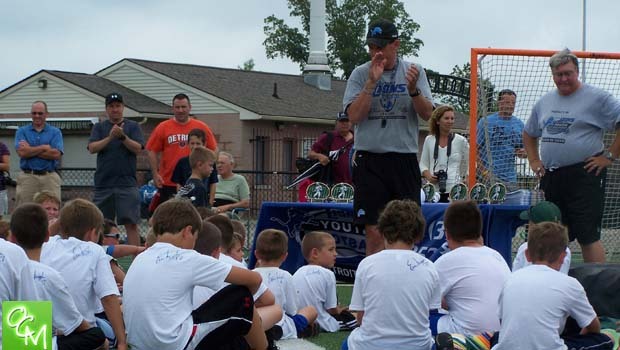 Participants learn football from excellent coaches and even get to meet current and/or former Detroit Lions players. Even through Detroit Lions Youth Football programs are non-contact and no pads, a large emphasis on the camps is to promote player safety. The lessons taught translate both on and off the football field. Glen LaGrou of Oakland County Moms – So what’s new for Lions Youth Football Camps? Chris Fritzsching, Director of Youth Football, The Detroit Lions – One of the main things that has happened since we’ve last spoken is the promotion of player health and safety. While that’s always been an emphasis of what we do, the emphasis is coming more to the forefront. Glen LaGrou of Oakland County Moms – Because of the parents? The one’s saying “I’m not sure I want my son playing tackle football…”. Chris Fritzsching, Director of Youth Football, The Detroit Lions – Exactly! What we are doing is being proactive, as best we can, in the education process. We don’t want to shy away from talking about concussions or signs and symptoms. We want to talk about these things. We want to let people know that we’re doing what we can to educate the parents, coaches and the players in these ways. Even though are camps are “non-contact”, we have implemented the whole “heads up” tackling program endorsed by the NFL and created by USA Football. Even though they’ve been emphasizes, they’re coming more to the forefront for our camps. We want to talk about the need for everyone to be involved. When a child plays football, it’s not the relationship between the coach and the child, we want that parent to be involved in the understanding of what they’re kids are involved with. We’re still going to focus on coaching football and teaching the fundamentals of the game but this, to me, has been the biggest change or emphasis over the past few years since we have last spoken. Glen LaGrou of Oakland County Moms – So, in addition to all the fun and football.. the big focus this year will be on football safety and education..
Chris Fritzsching, Director of Youth Football, The Detroit Lions – That’s (safety, concussion education) a huge component. I do a lot of work in my role with USA Football and “Heads Up Football”. As a Master Trainer in this program, my role is to teach the coaches and the kids the curriculum of equipment fitting, concussion awareness, heat and hydration practices and the “Heads Up Football” format. We’ve implemented this program in Lions Youth Football so parents know safety is extremely important. I don’t care if (a child) is playing baseball or riding a bike – you can get a concussion. Parents and kids need to know signs and symptoms of a concussion and all the facets of player health and safety. Our camps our non-contact and non-padded – always will be – but we’re still going to teach these important safety elements. For more info on how Detroit Lions Youth Football Camps emphasize player health and safety, please visit the Detroit Lions Youth Football website or www.USAFootball.com.